I'm excited to announce that our paper, "The cultural pages of comics: cross-cultural variation in page layouts", has been published in the Journal of Graphic Novels and Comics! It actually came out back around a year ago, but I was waiting for it to leave "early view." Since it's still unchanged, I figured better to just post it and get it out rather than waiting around. This paper is a follow up to our prior paper looking at how page layout has changed in American superhero comics across time. This project, largely undertaken by my student co-authors, instead compared the page layouts in six different types of comics from around the world. Our overall findings found that page layout could be a factor that characterizes different types of comics, since different cultures' layouts differed in consistent ways. In particular, Asian layouts (like Japanese manga and Hong Kong manhua) use more vertical segments than Western comics. Indy comics from the US and European comics tend to use more horizontal staggering, while American comics use more "pure" grids. These findings further contribute to showing that there are systematic cross-cultural differences between the "visual languages" used in comics of the world. We've shown in many studies (several of which are still on the way to being published) that cultures' comics differ across nearly every dimension possible, and often have variation within cultures (such as between genres). To some degree, such diversity calls into question just how consistent an abstract notion of the "comics medium" there is in the first place. More on this to come in the future for sure. The full paper is downloadable here, and along with all my papers here. 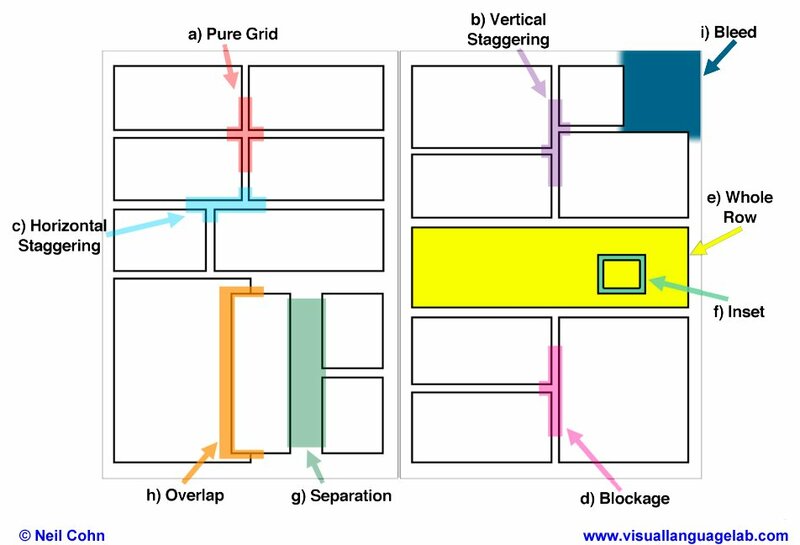 Page layouts are a salient feature of comics, which have only recently begun to be studied using empirical methods. 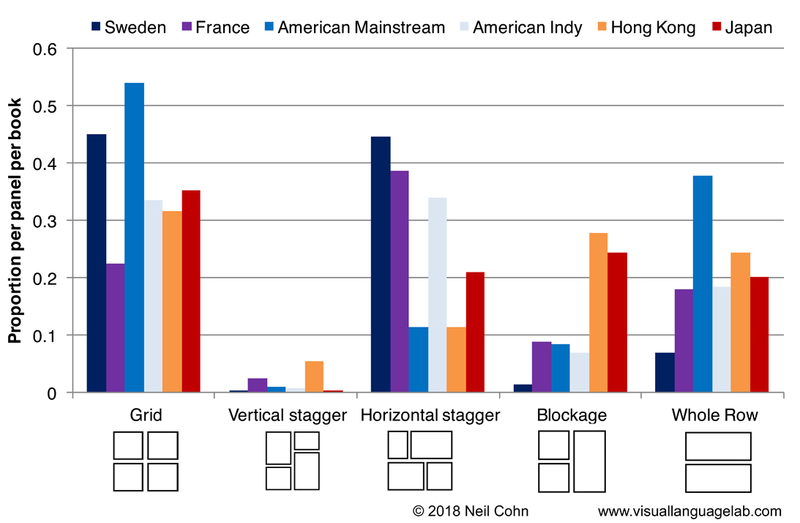 This preliminary study uses corpus analysis to investigate the properties of page layouts in comics from Europe (Sweden, France), Asia (Japan, Hong Kong), and America (Mainstream, Indy genres). Pages from Asian books used more vertical segments and bleeding panels, while European and American Indy pages used more horizontal staggering. Pages from American mainstream comics used widescreen panels spanning a whole row, and more variable distances between panels (separation, overlap). These results suggest that pages from different types of comics have different systematic characteristics, which can be studied by empirical methods. Cohn, Neil, Jessika Axnér, Michaela Diercks, Rebecca Yeh, and Kaitlin Pederson. 2017. 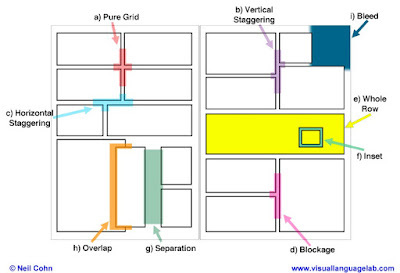 The cultural pages of comics: Cross-cultural variation in page layouts. Journal of Graphic Novels and Comics. doi: 10.1080/21504857.2017.1413667.